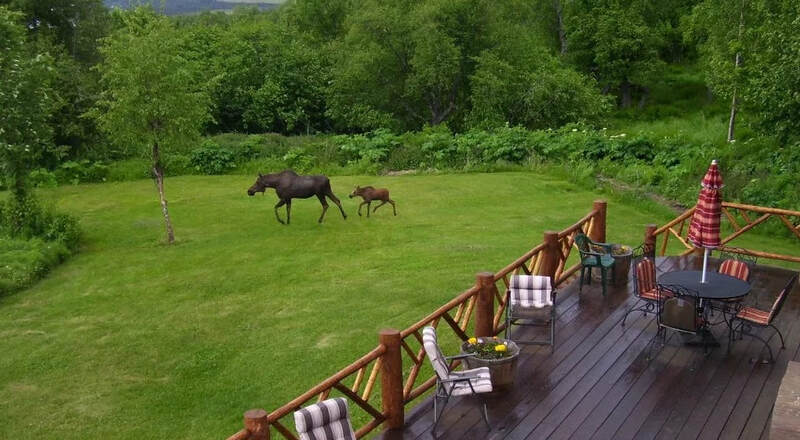 Welcome to Juneberry Lodge, a rustic log bed and breakfast in Homer, Alaska, with spectacular views of Kachemak Bay and visiting wildlife. Juneberry Lodge is known for its historic Alaskan artifacts and warm hospitality. We look forward to welcoming you and can book tours, charters and suggest activities to enhance your visit. Homer is known for its culinary as well as visual arts so we have lots of great restaurant recommendations. We also have a guest grill for you to prepare your catch of the day. In addition to individual guest rooms, the lodge easily accommodates groups of up to eight on the ground floor or six in the loft. The entire lodge can be reserved for groups up to fourteen. Contact us to let us know how we can help you plan your stay. Visit us on Facebook to start your adventure at Juneberry Lodge now! The history of Juneberry Lodge begins on April 26, 1929, when Jack Dietz claimed 134 acres on the north shore of Kachemak Bay. ​His was the second claim in the area under the 1862 act "To Secure Homesteads to Actual Settlers on Public Domain." Jack and Gladys raised their six children here, and upon his death in 1965, Jack's grave stone read "The Last of the First." this lot in 1987, living in the first floor while they built up, as Alaskans do. and greeted guests for 15 years until she retired in 2014 at age 86. ​Herb Engstrom's gold operation and many more unique Alaskan artifacts. Juneberry Lodge shares its pioneer heritage with visitors to the Kenai Peninsula and Kachemak Bay for an authentic Alaskan experience. Wake up to beautiful, sun-filtered birch and alder woods and a front row view of what’s happening outside. 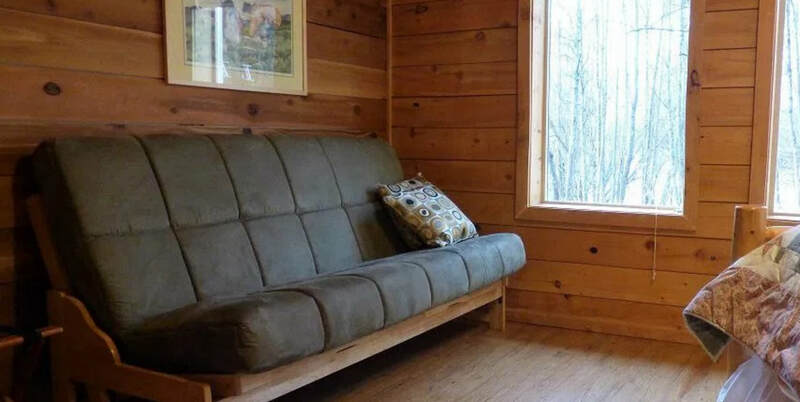 ​Be the first to spot the moose! Queen-sized hand-hewn log bed. Futon couch with supportive Pocket Coil Plus Mattress can be made into a comfortable full-sized bed. Sleeps 2 to 4. A most comfortable room for an extended stay! An unforgettable Alaskan experience for couples, families or friends. The Loft sleeps from two up to six with one queen bed and four built-in twin beds in the separate Bunk Room. The queen bed and private sitting area enjoy a stunning panoramic view of the bay, mountains and glaciers. A private balcony off the Bunk Room provides a dramatic view of Homer’s 13-mile Grewingk Glacier. Large private bathroom.